Kevin Harvick is an American professional stock car racing driver who currently competes full-time in the Monster Energy NASCAR Cup Series, driving the No. 4 Ford Mustang for Stewart-Haas Racing. He won the Daytona 500 in 2007 and was the Busch Series Champion in 2001 and 2006. 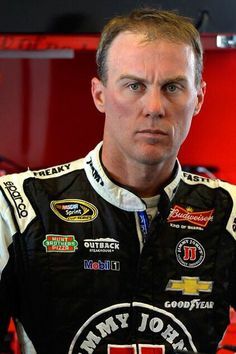 Born Kevin Michael Harvick on December 8, 1975 in Bakersfield, California, USA, to parents Mike and JoNell Harvick, he has a younger sister named Amber. He began his racing career at an early age, racing go-kart, and earned seven national championships and two Grand National championships. He married DeLana Linville on February 28, 2001. They have two children. *He was born on December 8, 1975 in Bakersfield, California, USA. *He was awarded 2001 Nascar Winston Cup Series Rookie of the Year. *He won the 2003 Brickyard 400 and 2007 Daytona 500. *He is an avid fan of New York Yankees.